I’ll cop to it; after last fall’s “Nobel Peace Prize” award to a president who, as of the award deadline, had done nothing to warrant it, and has done even less since, my self-esteem-respect as an American of Norwegian anscestry has taken a bit of a beating. But it’s on days like today – the 67th anniversary of the Norwegian raid on the Vemork heavy-water plant at Ryukan, Norway – that I get a bit of that old Norse møjø back. You may not have heard the story – largely because most American history teachers are illiterate about history, and partly because the font of all historical knowledge for most of them, Hollywood, transformed the event into an Anglo-American triumph (the atrocious Heroes of Telemark). Like much of what you learn about “history” from Hollywood, it’s BS. A little scientific and historical background: nuclear reactors need something to “moderate” their fission reactions – i.e. to keep them under control. The United States program used a mixture of Cadmium and Graphite. The Germans, for reasons best explained by a physicist, chose Deuterium Oxide – aka “Heavy Water” – a compound found in infinitesimally tiny quantities in all water. All you need to do is refine it out of all the regular water. 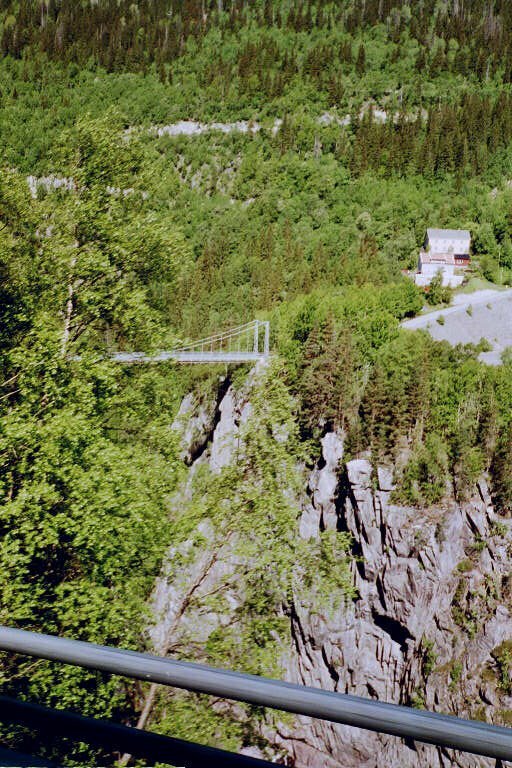 And in all of Europe in the early 1940s, there was exactly one facility that could refine bulk lots of Deuterium Oxide in the quantities a nuclear weapons program would need; the Vemork plant near the village of Rjukan, Norway. The British had wanted to attack the plant ever since they learned of its significance. The British “Special Operations Executive” – a wartime organization that sat at the intersection of intelligence and special operations, much like “Special Operations Command” in the US does today, and whose American analogue, the “OSS”, became the anscestor of the CIA and US Special Forces – established an agent inside the plant (Einar Skinnarland) who smuggled out blueprints and paved the way. In October of 1942, an SOE reconnaisance team with four more Norwegian operators (Jens Anton Poulsson, Arne Kjelstrup, Knut Haukelid and Claus Helberg), men who’d fled to the UK after the German invasion and undergone commando and intelligence training, were infiltrated into Norway to reconnoiter the area for a followup British commando raid. The four men were air-dropped into a remote area far from Ryukan, and skied for days through the gathering mountain winter before they could even begin their mission. …and then completely unraveled. The followup British commando raid to attack the plant failed catastrophically, with gliders and tow planes crashing in the snow and all the commandos either dying in the crashes or being caught and executed by the Gestapo, after revealing under torture the target of their raid. The Germans reinforced Vemork, in case the Brits tried again. The four-man recon team had to not only survive a mountain winter, but do it with an alerted enemy actively searching for them, and stay on the grid and able to assist the followup mission that had to come. Later that winter, it fell to them and six more Norwegian commandos to finish the job. The six commandos – Joachim Holmboe Rønneberg, Knut Haukelid, Fredrik Kayser, Kasper Idland, Hans Storhaug and Birger Strømsheim – dropped into Norway, linked up with Poulsson, Kjelstrup, Haugland and Helberg, and carried out the plan. Bypassing the heavily-guarded bridge that ran 600 feet above the Maan River, the team descended from the plateu above into the river gorge, snuck across the icy stream, up a cable tunnel, and through a window. Up for a bit of a climb? They encountered a caretaker – who turned out to be a Norwegian who was happy to help. The team placed the bombs – which destroyed the entire 1000-pound heavy-water supply – and escaped unscathed. The Germans dispatched 3,000 troops to try to catch the commandos – but all escaped, with six of them staying in Norway to carry on the battle, and the other five skiing to Sweden to return to the UK to carry on the war. Most of the team, after the war. Front: Poulsson, commander Leif Tronstad, Ronneberg. (Back) Storhaug, Kayser, Idland, Helberg, Stromsheim. Being lucky and skillful, they all survived the war. Being Norwegian, most of them lived long, healthy lives afterwards; all but Idland lived into the 1990’s; Poullson passed away this past February 2. Knut Haugland died this past Christmas; he was probably best-known to Americans, having participated in Thor Heyerdahl’s famous Kon Tiki expedition in the late forties. Joachim Rønneberg is still alive. There are those who say, with some factual justification, that the German nuke program could never have caught up with the US program, even without the Vemork raid. Thanks to eleven brave underdogs and their mission, patched together against impossible odds, we never needed to even try to imagine what London and Moscow would look like as craters. PBS’ Nova did an excellent documentary on the Vemork raid and its larger context, the Nazi nuclear weapons program. It includes a useful bio page on the whole group of Vemork raiders. This site also explains the raid, and the science, in excellent detail. It’s funny; listening to the guys from the raid (most of whom were still living ten years ago when the documentary was made), you’d think you were looking at and listening to old Norwegian guys at a Lutheran church lutefisk dinner in Park Rapids – and then you remember these are guys who sailed across the North Sea, went through British commando school, airdropped into Norway, spent a winter in a forester’s cabin living on reindeer meat and moss, and then carried out the kind of raid that ends up in the history books. You have to fight for your freedom. And for peace. It’s not something that you have every day; you have to fight for it every day, to keep it. It’s like a glass boat; it’s easy to break. It’s easy to lose. Whenever the Nobel committee embarasses Norway, I remember them, and feel much better, mange takk. This entry was posted in Geekery, History And Its Making by Mitch Berg. Bookmark the permalink. Thanks Mitch. I’m not Norwegian, but I’ll have a little more pride when I see that flag flying on NBC today. Wasn’t there some other operation against heavy water being transported on a boat in Norway? I seem to remember watching a documentary about that–Norwegian saboteurs blew up a passenger ship in order to destroy it. Tough stuff since they killed about a dozen innocent civilians. Yep. The Germans salvaged some of the Heavy Water; the Underground told London that it was going to be transferred by a heavily-guarded train to a ferry boat, and thence to a ship to Germany. SOE didnt’ know how much, so they detailed a group of Norwegians (led by Haugland, if memory serves) to sabotage the ferry. They placed a bomb in the hold, sinking it in the middle of the lake. The PBS article discusses that operation, and the diving expedition to recover the remaining heavy water a few years back. I watched it last week. Very gory, but silly in an ‘Evil Dead” sort of way. I learned from the film that modern Norwegian winter clothing resembles the winter gear I wore in Fridley in the 1970’s. Hey, here’s an interesting website! Tony Judt, “Postwar: A History of Europe Since 1945 (Penguin, 2006), p. 39. Not to mention 300,000 non-“administrative” German military personnel including a big chunk of the German Navy and twelve ground combat divisions – the highest ratio of troops-to-occupied civilians anywhere in Europe. They faced 50,000 of the Norwegian underground and about 80,000 more who fled to the UK and Sweden (versus about 15,000 who served the Germans). To their credit, the Danes were even more passive-aggressively intransigent. They faced 50,000 of the Norwegian underground . . .
Those would be the dwarves. Of course, Clownie’s forebears in Clownlandia fought the Nazis off with all the squirting lapel flowers they had. I’m afraid that the clown’s ancestors were on the, ahem, “other side”. Socialism tearing down the corrupt capitalist system, the people exerting their will & expunging all the undesirables & providing the mercy of extinction to the poor souls, like those with senile dementia, enduring “life without life”. Angryclown is All-American, Terry. The Clowns were here before the Indians. Certainly before your ancestors came to these shores, smelling of fish and desperation. …and that calm self-assurance that comes from knowing your (pl) ancestors were my ancestors’ beeyatches. If you ever have the inclination, you might rent the old Charles Boyer/Hedy Lamar movie, “Algiers” (I’ve become a big fan for some reason). The woman who plays Boyer’s mistress in the film, billed as Sigrid Guri, was actually born Sigrid Guri Haukelid. She was the fraternal twin of Knut Haukelid the commando.